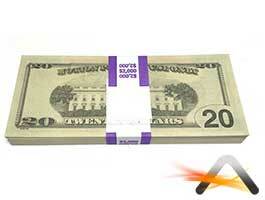 This is a crisp new $20 dollar bill stack that would equal $2,000 in fake cash. Each item features (100) prints, 2-sided full color printed New Style $20 bills. Each stack comes with a removable $2,000 bank band. No filler sheets. Stunning detail and quality. Professionally printed and cut. These are made by the leading producer of motion picture prop money. NOTE: Please read important information about legal use of prop movie money on this page. Price shown is for 1 FULL PRINT stack of (100pcs) $20 bills that would equal $2,000.